Florida with 11 points on 5 possessions so far in 2nd half. Wisconsin let KeVaughn Allen get some confidence and they're paying the price for it. Allen with 20 points. Gators up 45-39 w/ 15:47 left. Ethan Happ spinning on 'em! ???? Happ quickly up to 12 points (5-9 FG) to GK along with 3 assists and 2 rebounds. Happ quickly up to 12 points (5-9 FG) to go along with 3 assists and 2 rebounds. Florida's Kasey hill has done a helluva job on Bronson Koenig. Only 3-shot attempts and 3-points. FTs might be a factor late. Gators 8-9 so far. Wisconsin 5-9. That should have been offensive goaltending. These guys have no clue what's going on. They were going to give Allen a chance at a three-point play. Wait. Can't hear the call - how did Florida get the basket and possession? Wisconsin is 5 of 6 this half but the Badgers have committed three turnovers that have led to seven Florida points. 51-43 UF at 13:30. UW fans giving Verne Harris the Bronx Cheer. Badgers fans in MSG starting to come alive. Maybe that can get Bronson going. The senior with a great dribble step back for separation against a 6-3 defender. 51-45 Florida. Fouls piling up for #Badgers . Third on Vitto. Wisconsin only has five fouls in the half. It feels like eighty. THREE from Koenig to cut it to four with 12:30 left to play. NO REGARD FOR GATOR LIFE! #Badgers within 52-48 with 11:57 left. Happ has 14, Hayes 11, Brown 10 and Koenig 8. #Badgers have cut 10-pt deficit to 4 but FLA has ball Happ, Brown and Trice with 3 fouls. 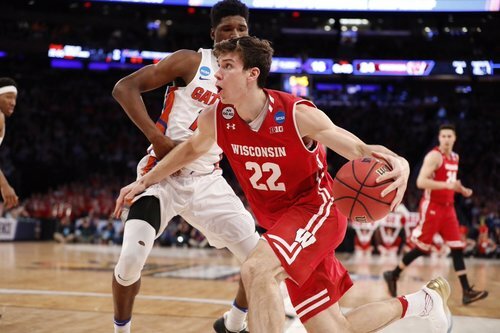 A Koenig 3-pointer and an Iverson block has got Wisconsin fans excited again. Badgers trail 52-48 with 11:57 left. #Badgers Koenig has 5 pts this half. THAT was a violent BLOCK from Khalil Iverson. Florida is in the bonus with 11:48 to go. We have 11:48 left and Gators are in the bonus. Florida in the bonus for the final 11:48. No UW player with four fouls, but Brown, Trice and Happ each have three. #Badgers on a 12-1 run and lead 53-52. Hayes (7) and Koenig (5) have combined for all the points during the surge. Nice look by Vitto to find Hayes down low for the basket and foul. Converts the three to put the Badgers up one with 10 mins to play. UW has started to get the ball back into the post and - wouldn't you know it - they are scoring. Imagine that. KeVaughn Allen has 27 of Florida's 55 points. No other Gators player has more than seven. Brown with 4 fouls, 9:16 to go. Sloppy play from both teams leads to a Florida lay-up and a foul on Brown. Fourth on Vitto.